Athens, ca. 2nd to 3rd century AD. AE 18. 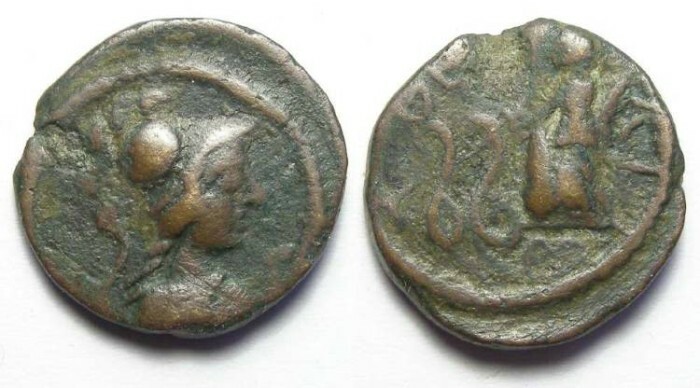 Date : Struck in the 2nd to 3rd century AD under Roman rule. Size : 17.x 2 18.3 mm. Weight : 4.42 grams. Reference : Svornos plate 94, #40 to which it appears to be a die match. Grade : good Fine, mid brown patina. Reverse : Demeter in a biga drawn by serpentsits shoulder, with a AQH to the left.